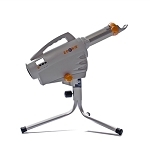 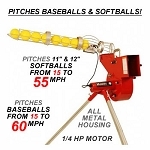 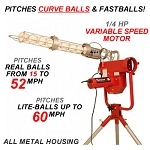 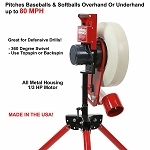 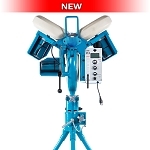 Discount Baseball Pitching Machines • Low Prices • Free Shipping! 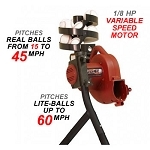 Improve your game with Pitching Machine Stop's quality lineup of baseball pitching machines. 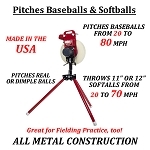 Not only are they great for baseball pitching drills and hitting practice, but they can be set up to throw grounders and fly balls to improve your defensive game, too. 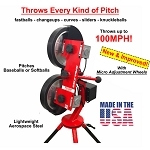 Below, please browse through our baseball pitching machine collection. 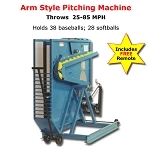 Be sure to scroll to the section below the products that further details the baseball machines you'll find in this category. 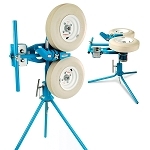 If portability is your number one concern, there are no pitching machines that are more portable than Louisville Slugger baseball pitching machines. 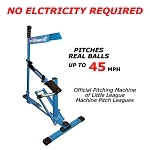 Super lightweight, they require no electricity at all - not even batteries - because they employ heavy duty springs to launch the ball at speeds of up to 50 MPH from 60 feet. 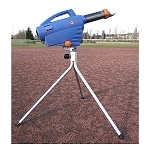 If you want more power and flexibility, Zooka pitching machines run on rechargeable batteries and are also about as portable as you can get! 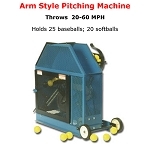 If you are looking for a low cost baseball pitching machine for kids to get their game to the next level, Heater Sports has quite a few affordable pitching machines that should do the trick. 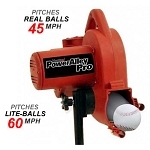 They throw real balls as well as a variety of pitching machine balls, from lite balls to dimpled balls. 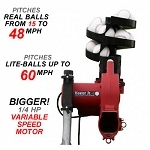 Many come with auto ball feeders which makes practicing all by yourself a snap. 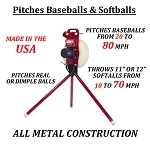 When it comes to precision and durability, JUGS Sports leads the industry. 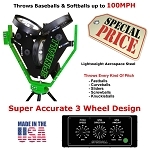 First to offer a 5 Year Warranty, they are the baseball pitching machine of choice for more high school, college and professional baseball teams than any other brand. 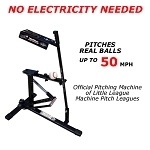 Many players and teams report that they have been using a JUGS pitching machine for more than a decade with no problems. 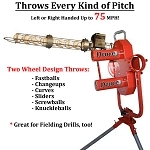 If you want the same quality as a JUGS machine but don't want to pay a hefty price for just a name, First Pitch pitching machines are virtually identical to JUGS machines. 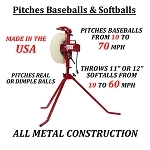 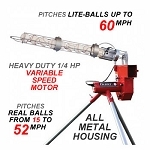 Unlike JUGS pitching machines, First Pitch pitching machines are made completely in the USA, they feature all metal construction, super powerful Lesson/Minarik DC drive motors that deliver speeds that JUGS cannot touch for the price. 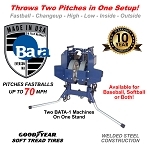 A baseball pitching machine from BATA Baseball means you have stepped up to the big leagues. 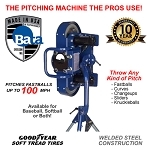 BATA pitching machines are what many pro teams are using and their fully enclosed wheels provide an important safety feature. 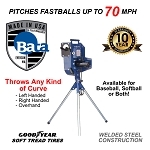 BATA's top of the line baseball pitching machine can throw any pitch a big league pitcher can - up to 100 MPH! 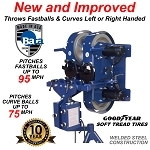 Finally, our personal favorite is the Rawlings/Spinball Sports pitching machine lineup. 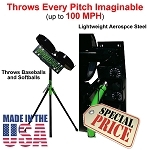 They are the most accurate, lightweight pitching machines you can buy and can throw any pitch ever invented. 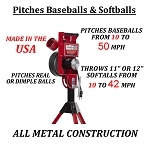 Not only that, but they can throw both baseballs and softballs and are the only pitching machine manufacturer that includes the wheels in their outstanding 5 year warranty. 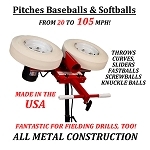 There is truly no better curveball pitching machine for the money than a Spinball Wizard or Rawlings Pro Line 2 or 3 wheel pitching machine.